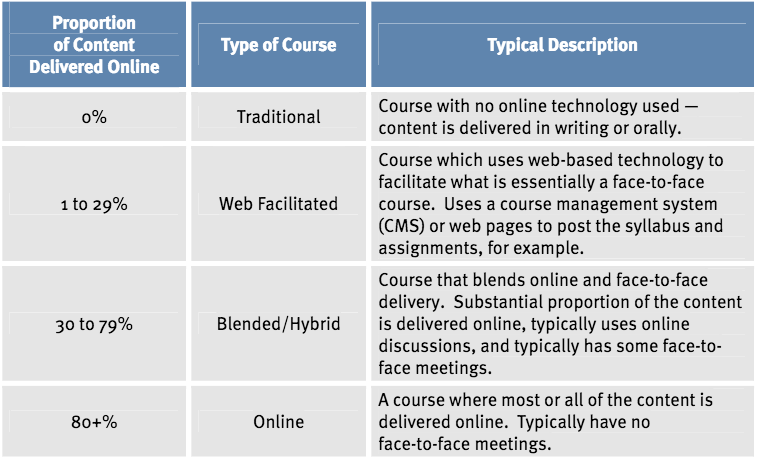 How much Online Content in Blended Learning? In 2007 The Sloan Consortium ( presently the Online Learning Consortium) asserted that when 30-79% of class content is available online that is a blended learning class. Another often referenced definer of Blended Learning is The Christensen Institute. Student control of Time, Place, and Path are important in this definition. Pick the tool you will be using for creating storyboards (MS Office tools: Word, Excel, PPT). Create a sketch of the title page with the name of the course and 3-5 page mockups containing the course sets out to accomplish, e.g. After you have outlined the principal structure of the course, it’s time to go deeper and describe the structure of every section of the course. Try to visualize the general layout of every page. Enumerate all screens in the storyboard, e.g. 1/16, 2/16, 3/16, and so on. Lay out the screens of your storyboard in order and try following the story they tell. Look at them through your learners’ eyes. Is all information delivered in a logical order? Did you leave out something important? Are your notes clear enough so that you will be able to build a complete course using your storyboard for reference a week later? Have you touched upon all important areas? If you need to present your storyboard to your client (student) or boss (student) for review, it pays to show it to a good friend first and ask for feedback. Ask them to read your storyboard and then retell what they took away from it in their own words. in Geenio (https://www.geen.io/) this mode is called the Pathboard, and entering it allows you to see the structure of your whole course, the sequence in which pages and tests are presented, as well as the connections between them. Some course editors not only provide you an overview of your course’s structure, but enable you to edit the course’s structure and add additional elements to it as well. State your objective: Each lesson should have one concise, action-oriented learning objective to ensure your lesson design process is focused. Think as a private tutor: Learners today are inundated with media tailored to them and they expect learning to be tailored as well. So think about how the tools available, including new technologies, will help create meaningful learning moments for all your students. Storyboard before you build: Being able to see a complete lesson, especially one that integrates various mediums, is essential to creating a successful learning experience. Build towards high-order thinking: Technology in education can go beyond multiple-choice questions and document repositories. Don’t be afraid to integrate tools that let learners create and share. Remember you’re learning too: Reviewing learner results from a lesson shouldn’t just be about their score, but also evaluating how effectively the lesson was developed and executed so your teaching can adapt and learn as well. tools for iOS, Android etc. Storyboard the game. Make sure there’s room for failure and multiple courses of action. This is the third in our Flipped/Blended… Teaching/Learning Collaborative Development Series. Faculty considering the next steps toward flipping/blended..teaching/learning and instructional designers and design consultants will all find something of benefit from this series. In the spring we explored what it means to flip a classroom and added to the flipped classroom toolkit. Over the summer a team of instructional designers assisted a faculty member in designing a flipped lesson. This collaborative development process is the basis of the series. The International Journal of Mobile and Blended Learning (IJMBL) provides a forum for researchers in this field to share their knowledge and experience of combining e-learning and m-learning with other educational resources. Providing researchers, practitioners, and academicians with insight into a wide range of topics such as knowledge sharing, mobile games for learning, collaborative learning, and e-learning, this journal contains useful articles for those seeking to learn, analyze, improve, and apply technologies in mobile and blended learning. The journal spans theoretical, technical, and pedagogical issues in mobile and blended learning. These embrace comprehensive or critical reviews of the current literature, relevant technologies and applications, and important contextual issues such as privacy, security, adaptivity, and resource constraints. The primary mission of the International Journal of Mobile and Blended Learning (IJMBL) is to provide comprehensive coverage and understanding of the role of innovative learning theory and practice in an increasingly mobile and pervasive technological environment. As technology enables a more seamless experience of device supported learning worlds that may integrate mobile, embedded, augmented, and immersive technologies, we may expect to see increasing interest and activity in blended approaches to learning. IJMBL brings together researchers at the forefront of this field, in both technology and pedagogical practice and assists them in the development and dissemination of new approaches to both mobile and blended learning. In this session we will finalize the design of the May 27th & June 24th events. Link to planning document. During our March 11th FridayLive! event, Irene Knokh helped us explore the flipped classroom. There was interest expressed in building a flipped classroom toolkit. On March 17th TLT Members were invited to start this work. On March 24th TLT Members met and decided to create a Flipped/Blended Learning Series. On March 31st the planning continued and the 3 part series has begun to take shape. In April we decided to focus on 2 events. On April 27th we finalized the dates (May 27 and June 24th) and began to design the first session. The recently-released New Media Consortium Horizon Report details six up-and-coming technologies in the next five years for K-12 classrooms. Horizon #1: In the next year, or less. Horizon #2: Within two to three years. Horizon #3: Within four to five years.